We here at Alex's DBZ RPG 5 are giving away a brand new Dragonball Z Manga Box Set with Volumes 1-26 completely free for what we are calling our "Summer Giveaway." This is by far the best and biggest prize we have ever given away! Below is the information that you need to know about who can enter and how. Please read the page carefully so your submission gets accepted! Who Can Enter: Any member of the RPG can enter. This includes new members who apply to the site on July 4th or after during the course of this giveaway. If you are not currently a member but want to become one, you can do so by following the step by step procedure on the join page. You must be accepted as a member and listed on the player roster before you submit your registration to the giveaway or else it will be ignored. When: You may send submissions for the giveaway starting July 4th, 2009. The winner will be chosen in the first week of August. Rules: You must be an accepted member of the site listed on the roster to enter. You must complete at least 1 spar and complete at least 1 update (must take place on or after July 4th) before you submit your registration. Information on how to do these things can be found on the how to play page. Links to the forum posts which contain your spar and update are required on the form below. Anybody may enter regardless of geographical location (this may change if difficulties arise). Limit to one entry per member. If you are caught trying to submit multiple entries or using multiple identities you will be removed from the site. One (1) winner will be chosen at random and notified via email during the first week of August. If you go inactive or are removed from the website before the drawing, then your submission will be voided and no longer count. As a reward to current members, if you are a member of the site that has been accepted before July 4th, 2009, your submission will count as two entries. Those accepted to the site on or after July 4th will receive one entry. 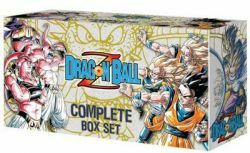 Complete set includes Volumes 1-26, an exclusive double-sided poster, and a DragonBall Z collector's booklet! How: To enter, simply fill out the form below and submit it (remember you must be an accepted member on the RPG and have completed at least 1 spar and 1 update before submitting).